In our last blog, we touched upon a few tips that will help English students get a grip on English reading, and eventually on the English language as a whole. Let us just glance back at what 'reading' really implies and why it is an important skill to develop. Reading is one of the four pillars of learning the English language; the others being writing, speaking, and writing. Reading is a skill that comes in handy in everyday life, whether it is to read and understand a piece of news or to gather knowledge from a manual, how do you suppose you can accomplish these tasks without being proficient at reading? Not just this, if you are a student, Reading makes up for a majority of your exam preparations, so much so that reading and comprehension is a separate educational discipline in itself. Whether you aim to crack TOEFL or ESL, reading and comprehension is one of the categories that you need to prepare and tackle. If you can put a couple of alphabets together and can form a letter, this does not amount to reading. Reading as a skill implies that you can read at a certain speed while grasping the message of the text. Here are a few tips to help you develop this skill, while also improve your overall spoken English in the process as well. • Treat dictionary as a guide, not a book: One of the most common advices given to amateur English students is to keep a dictionary handy, so that they can check words they do not understand. It is important to stop at that! Refer dictionary only when you cannot understand the key words, the ones that are important to understand the message of the text. Some students make it a habit of referring the dictionary for each and every word, and this seriously hampers the thought flow. • Read books of your reading level: You are in your 20s, and have just started learning English. This does not mean that you straight away jump into reading a Dan Brown or Stephen King. 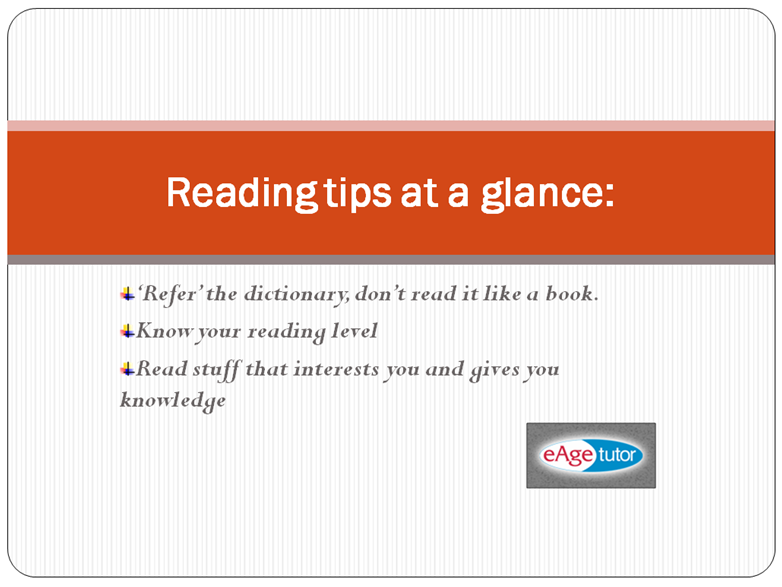 Your reading age is probably primary or adolescent, so it is best you read books for that level. This way you will learn the basics and get a better understanding of the grammar in a systematic manner. • Read light: How many of you have been advised to read newspapers? Do you really understand everything that you read in a newspaper? The language used in newspapers is very structured and disciplined. While it is a great tool for learning grammar and syntax, it can be quite overwhelming for an amateur student. Read lighter things like a magazine, funny editorials, etc. to get a grip on English without having to endure a boring task! English fluency and improving English skills is a problem many people face. The best result-oriented method is to connect with an online language course like eAgetutor. Improving English takes dedication and efforts, and an online tutor is your best option for developing English fluency and developing the requisite skills.